The reserve championship - sometimes known as the A team - could be about to return. Hull FC have become the first Super League club to announce they will bring back a reserve team next season. The move is sure to be followed by Warrington and Wigan, who have already expressed their desire for an under-23s competition, and looks set to consign the controversial dual-registration system to the scrapheap. 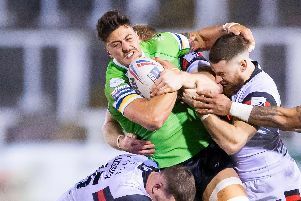 Super League clubs opted to form links with Championship clubs after vetoing plans formulated by the Rugby Football League three years ago for a competition to bridge the gap between under-19s rugby and Super League. It was seen as cost-cutting at the time but the dual-registration system pleased neither set of clubs and left a host of players no longer eligible for under-19s rugby with no team to play for. Hull FC, who are to merge their under-19s academy side with Hull KR from next year, insist an under-23s team is the best model and say at least eight clubs have expressed an interest in forming a professional league, with reigning champions St Helens and ambitious Leigh Centurions thought to be among them. Club owner Adam Pearson said: “We have struggled to get the right playing foundations in place for our up-and-coming young professional players. “A Hull FC under-23s reserve team in a competitive league would offer that platform for our academy players to play at a more senior level and gives them the chance to play regularly, at a good standard, with existing team mates and structures, which will develop their talents. The new competition is expected to provide opportunities for over-age players. Hull coach Lee Radford said: “We are currently failing these young players by raising their expectations and aspirations before giving them anywhere near enough of a shot at the game to develop at first-grade. “Our full-back Jamie Shaul is a great example of a player who came into our system late, found opportunities limited and just a couple of seasons ago couldn’t even get a game at lower championship level. Hull say that, if no central format can be agreed, they will play friendly fixtures against other interested clubs.